A PLANT species native to tropical and subtropical America was introduced in India as an ornamental shrub during 1809-1810. 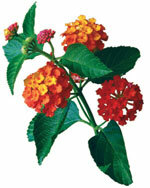 Called Lantana camara, this weed is now found all over the subcontinent. Similar is the case with freshwater species Eichornia crassipes (water hyacinth). This weed was introduced from Brazil during 1914-1916. Invasive plant species present a serious environmental, economic and social problem around the world as their abundance can lead to loss of biodiversity, and changes in an ecosystem. Despite substantial research, not much is known about why some plants turn invasive and dominate native plants in new habitats. A common but rarely tested assumption is changes in several ecological or evolutionary factors enable these plants to become more abundant in their new homes. Scientists in a global collaboration tested this “abundance assumption” on 26 plant species at 39 sites in eight countries, including New Zealand, US, and Germany. They collected data on species-specific distribution and their abundance at the sites. Each site (0.1 hectare) was representative of a particular ecosystem, like tallgrass prairie. The data was analysed using various statistical packages. The research team found that the “abundance assumption” did not hold true for the majority of a species. Twenty of the 26 species examined had either similar or lower abundance at introduced sites compared to native sites. For instance, grass species were abundant both in the native country and the introduced country, while herbs were more abundant at home, stated the study published in the February issue of Ecology Letters. The researchers said increase or decrease in a species’ population is not a precondition for invasion success; and increases in species abundance are unusual. Instead, a better generalisation would be abundance at native sites can predict abundance at introduced sites, they claimed. Abundance of introduced species at a site could help evaluate whether the species should be introduced at other sites, said lead author Jennifer Firn from the Queensland University of Technology, Australia. “The finding provides a criterion for biosecurity screening processes.” It may help develop reliable standards for preventing introduction of invasive species, said M Irfan Qureshi, assistant professor at faculty of natural sciences, Jamia Millia Islamia in New Delhi.